Pre-requisites: This training is suitable for occasional / domestic users only. This course is not suitable if you are using a chainsaw regularly in a professional capacity. This course will provide you with the appropriate techniques & safety guidelines to ensure that you are not only confident when using a chainsaw but also aware of relevant health and safety requirements making sure you stay protected. This course is ideal for domestic or occasional users who wish to learn the essential operation and maintenance of a chainsaw, for example you may have an area of Woodland at home that you want to manage. 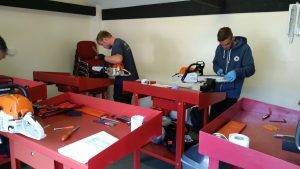 Once you have successfully carried out this course you will receive a Lantra Awards Certificate of Training and Assessment in Chainsaw Maintenance and Cross-Cutting. If you are planning on using the Chainsaw regularly in your workplace, or want to progress onto further training such as Tree Felling we would recommend our 3 day Chainsaw Maintenance & Cross-Cutting course with City & Guilds Assessment.